This web site is provided by Stillsonworks on an "as is" and "as available" basis. Stillsonworks believes this web site and its server to be free of viruses or other harmful components but cannot make a guaranty to that effect. Use of this web site is at the sole discretion of the user. As such, user agrees to hold Stillsonworks and its owners and successors harmless against any liability that may arise through the use of this web site. This web site is intended for use by adults only. Use of this site by any person under the age of 18 must involve supervision by an adult. 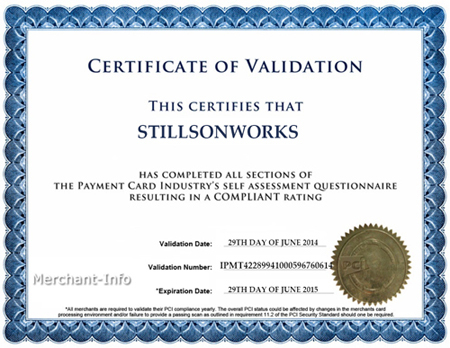 The Stillsonworks web site was designed to support secure online purchasing through secure socket layer (SSL) technology. Information provided to us as a result of your online purchase is completely confidential and will not be disclosed or sold to any other party. Under the Fair Credit Billing Act, your credit card provider cannot hold you liable for more than $50 of fraudulent charges. In the event of unauthorized use of your credit card, you must immediately notify your credit card provider in accordance with its reporting rules and procedures.